They say that all that glitters is not gold. 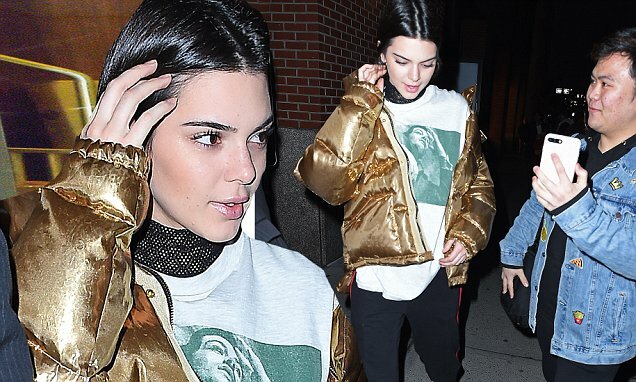 And that was certainly the case when Kendall Jenner rushed past an adoring fan while dressed in a golden puffer jacket in New York on Wednesday. The self-styled supermodel was clearly in a rush after stepping onto the streets of the Big Apple, for she gave her selfie-seeking supporter the swerve, no doubt due to the fact she was due to attend a pressing engagement. The 21-year-old professional clotheshorse was in no mood to slow down after taking to the street in her gold jacket, printed T-shirt, tracksuit trousers and white trainers. The reality television personality was surely disappointed at having to rush away, but at least the young gentleman got the chance to share a few brief words with the sparkling with before she left.